See in Glossary. Within the Flare, you pick and choose which Elements you want to include from any of the Textures. Elements The number of Flare images included in the Flare. Image Index Which Flare image to use from the Flare TextureA texture containing images used by a Flare asset. It must be arranged according to one of the TextureLayout options. See in Glossary for this Element. See the Flare Textures section below for more information. Position The Element’s offset along a line running from the containing GameObject’s position through the screen center. 0 = GameObject position, 1 = screen center. Size The size of the element. Color Color tint of the element. Use Light Color If the Flare is attached to a Light, enabling this will tint the Flare with the Light’s color. Rotate If enabled, bottom of the Element will always face the center of the screen, making the Element spin as the Lens Flare moves around on the screen. See in Glossary If enabled, the Element will scale up when it becomes visible and scale down again when it isn’t. Fade If enabled, the Element will fade in to full strength when it becomes visible and fade out when it isn’t. Flare Texture A texture containing images used by this Flare’s Elements. It must be arranged according to one of the TextureLayout options. Texture Layout How the individual Flare Element images are laid out inside the Flare Texture (see Texture Layouts below for further details). Use Fog If enabled, the Flare will fade away with distance fog. This is used commonly for small Flares. A Flare consists of multiple Elements, arranged along a line. The line is calculated by comparing the position of the GameObject containing the Lens Flare to the center of the screen. The line extends beyond the containing GameObject and the screen center. All Flare Elements are strung out on this line. For performance reasons, all Elements of one Flare must share the same Texture. This Texture contains a collection of the different images that are available as Elements in a single Flare. The Texture Layout defines how the Elements are laid out in the Flare Texture. 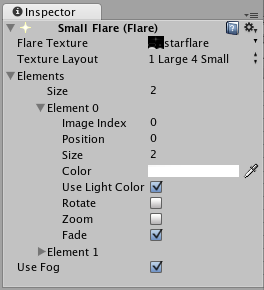 These are the options you have for different Flare Texture Layouts. The numbers in the images correspond to the Image Index property for each Element. Designed for large sun-style Flares where you need one of the Elements to have a higher fidelity than the others. This is designed to be used with Textures that are twice as high as they are wide. Designed for complex flares that require 1 high-definition, 2 medium and 8 small images. This is used in the standard assets “50mm Zoom Flare” where the two medium Elements are the rainbow-colored circles. This is designed to be used with textures that are twice as high as they are wide. See in Glossary will hide the Flare, even if the Collider does not have a Mesh Renderer. If the in-between Collider is marked as Trigger it will block the flare if and only if Physics.queriesHitTriggers is true. See in Glossary to the shader that you would like to use as the override.